Candidates for Hidalgo County judge, Richard Cortez, left, Democrat, and Jane Cross, Republican, answer questions from a group of McAllen International Baccalaureate students during a debate forum at the McAllen Chamber of Commerce on Wednesday, Oct. 3, 2018, in McAllen. McALLEN — Hidalgo county candidates took turns answering well-thought-out questions from four high school students during a debate here Wednesday evening. 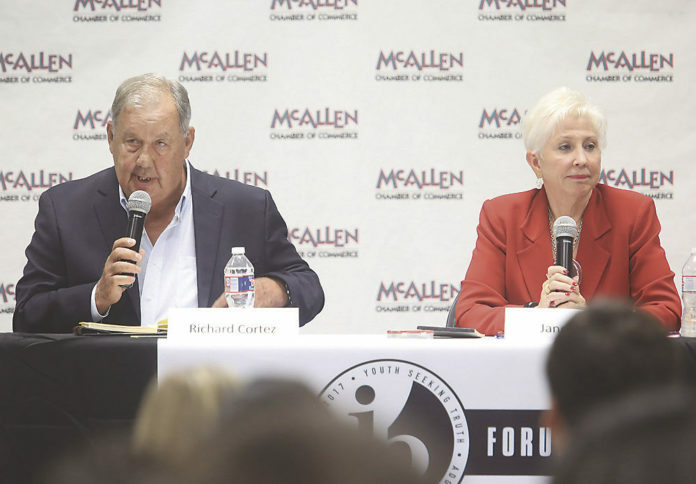 Dozens of people, both young and old, filled the McAllen Chamber of Commerce, where the International Baccalaureate Programme hosted its first student-led debate. The event was well attended, with about two dozen people standing along the walls of the large room. “This is a moment that we’ve really been waiting for,” 17-year-old Sydney Ramon said, adding the group has been working for over a year on launching a series of debates. “This is the first real debate that we’ve had with the venue and the people,” the 17-year-old panelist said. Ramon, along with Victoria El-Khoury, Christopher Ochoa, and Pablo Ramirez, took turns questioning the two people vying for the county’s highest elected seat: Democratic candidate Richard Cortez and Republican nominee Jane Cross. The students put the pair on the spot with well-researched and wide-ranging questions that touched on a slew of topics, including creating healthier communities, investing in infrastructure for colonias, lowering the unemployment rate and creating opportunities for educational attainment. Almost all of the questions were prefaced with numbers and research. For example, the students pointed out that 35 percent of the county’s population is uninsured before asking them about health care. Cross said everyone in Hidalgo County needed to be insured, but called it a daunting task. She suggested putting more money into the clinics that offer services for low-income patients. Cortez said the county had to provide its share, but noted that one of the ways to defray the costs of care was to get people to adopt healthier habits. He also said the county needed to leverage state and federal funds. “Health care is one of the largest costs this country is facing, and we have to do something very quickly because we’re going to run out of money quickly,” he said. Students also highlighted that only 21 percent of population over the age of 25 in Hidalgo County has an associate degree or higher before asking about educational opportunities and whether they believed the new medical school was creating them. “The best way to get out of poverty is to receive an education,” Cortez said, but added that the Texas needed to do more to fund universities and schools across the state. South Korea, after the Korean war, spent all of its resources on educating the populace and investing in human capital, and now, decades later, it has one of the highest educational attainment rates in the world, he said. Cross advocated for trade schools, saying only a select few can get into medical school. There are more opportunities outside of the school for the general population, she said. Both candidates agreed on a number of issues, including investing in a skilled workforce. The debate ended without any major fireworks, fulfilling the students’ attempt to create a space where important issues could be discussed in an amicable manner. “County judge is a very hard position to learn about, and I think this debate was great in informing the public and teaching everyone what that actually is,” Ramirez said after the debate. And while the forum served as an all-around educational opportunity, it also provided the student’s with something more desirable — a voice of their own.